Description: Screenshots on back show the cathedral and Gotham City Hall. The pictures are from the NES version of the game. Box Text: Let the Battle Begin. This is you chance to battle the diabolical Joker for the freedom of Gotham City. Incredibly strong and armed to the teeth with a vengeance. Batman is prepared to put his life on the line to seek out The Joke and put an end to his evil reign of terror. But it will not be easy. 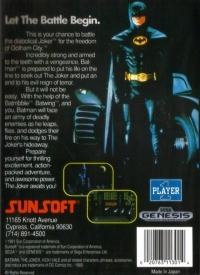 With the help of the Batmobile, Batwing, and you, Batma will face an army of deadly enemies as he leaps, flies and dodges their fire on his way to The Joker's hideaway. Prepare yourself for thrilling excitement, action-packed adventure, and awesome power. The Joker awaits you! 03-13-2019 tripredacus Description Screenshots on back show the cathedral and Gotham City Hall. The pictures are from the NES version of the game. 04-10-2017 shepard11 Box Text Let the Battle Begin. This is you chance to battle the diabolical Joker for the freedom of Gotham City. Incredibly strong and armed to the teeth with a vengeance. Batman is prepared to put his life on the line to seek out The Joke and put an end to his evil reign of terror. But it will not be easy. With the help of the Batmobile, Batwing, and you, Batma will face an army of deadly enemies as he leaps, flies and dodges their fire on his way to The Joker's hideaway. Prepare yourself for thrilling excitement, action-packed adventure, and awesome power. The Joker awaits you! 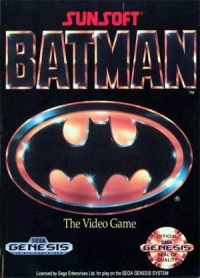 This is a list of VGCollect users who have Batman (cathedral screen on back) in their Collection. This is a list of VGCollect users who have Batman (cathedral screen on back) in their Sell List. This is a list of VGCollect users who have Batman (cathedral screen on back) in their Wish List.